How to properly feed your bunny. What to feed and not to feed your bun. You can almost excuse the public for buying these carelessly thought out products that populate the shelves of virtually every pet store in America, but I cannot let the companies that produce this junk off the hook. They are not thinking of the health of our pets and I feel it is shameless that they produce and sell such terrible products, most of which are not good for your rabbit. 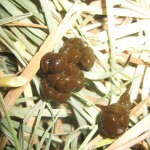 Anyone who knows ANYTHING about rabbits knows that they need to have a very high fiber diet that is about 80-90 percent grass hays. They also know that rabbits have a voracious sweet tooth and will gravitate to all the wrong foods, just like most children. I am only going to discuss gourmet pellets and hay in this article, but most of the other treats produced by the large pet companies are awful for your bunny as well, including all treats with seeds and nuts, yogurt or dairy and those with lots of flour and sugar as main ingredients. We as our rabbit’s quasi parents, need to gently guide them into eating what we know is best for them, just as we would our own human children. In that quest, many bunny moms and dads will wrongly turn to gourmet pellets and hay. They often think that by putting carrots, corn, dried peas, and all kinds of other unhealthy treats into the mix, that they will be eating more hay and therefore getting more of “the good stuff”. In practice, it never works that way. Rabbits are foragers and will pick through every piece of hay to find the best pieces. Just watch a rabbit eat and you will see this. When giving them a mix with lots of treats inside, you will see your bunny eat every single treat piece first and leave all the stuff that you really wanted him to eat in the first place. Only when every single treat piece is gone, will you see them turning to the relatively boring hay or pellets you gave them. 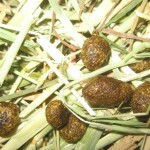 While I can understand why some people try the hay varieties, the gourmet pellet varieties are just silly and illogical. Rabbits should not have very many pellets each day, if at all and making it even more potentially harmful for your pet by adding a bunch of junk does not make sense. When I talk to people in the public about their rabbits during my educational efforts, you would be surprised to find out how many people out there buy and feed this stuff to their bunnies. They tell me that they love their pet and want to give him something extra special. What they do not know is that their loving gesture is in reality not a good thing. I condemn the large pet companies who make this stuff, because they promote and sell it, knowing that most of it is not good for our pets. We assume because of their vast resources and marketing that they would never sell something that is bad or actually harmful for our bunnies. That general assumption could not be further from the truth. These types of products have now spawned a new breed of less harmful merchandise where herbs and dried carrots, etc. have been inserted into bags of Timothy hay. This is probably due to the fact that many pet rabbits will not eat the pet store hay that these companies sell. 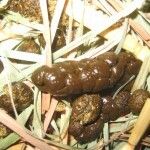 It is too dried out and old and most rabbits like their grass hays fresh and somewhat moist. Many rabbit owners confuse their rabbits not wanting old store bought hay into meaning that they do not like to eat hay. These people think that if they get a treat hay with all these things in there, that their rabbit will become healthier and eat more hay. The truth is if the bunny’s parents sought out and provided fresher, tastier hay, that their bun would eat it non-stop. I have yet to meet a rabbit who simply will not eat aromatic fresh green hay, but they will always defer to tastier and sweeter foods like herbs and carrots if it is available. 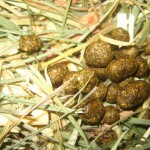 The problem arises when they eat so much of these other things and do not eat enough of their hay. 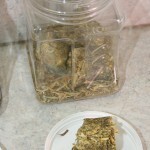 The treats replace large amounts of hay that would normally otherwise be eaten. I think a more healthy and logical strategy would be to find a source for tasty fresh Timothy hay or Orchard grass for your bunny and then supplement it with good healthy treats that you provide on the side, when it is appropriate. You can find fresh herbs or very small pieces of fresh carrots at your grocery store and control the amount that they get and the quality, too. Fresh foods are almost always better than dried and preserved varieties. If your bunny is getting a small variety of healthy leafy greens and herbs each day (equal to twice the size of his head), then he will be receiving the best possible diet, along with his unlimited fresh hay. He does not even need rabbit pellets at all to be healthy and certainly not gourmet pellets. The gourmet hays are not the answer, either. While I do not feel that they are nearly as harmful, they are not the way to get your rabbit to relish his daily meals of hay. Find your local feed store and if you cannot use and store a whole bale of fresh Timothy hay, then ask them to sell you a couple of flakes or a large bag full. Most will do this and then you do not have to store a complete bale. 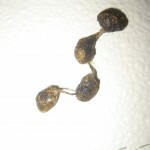 Be certain to keep it very dry and out of the direct sun. Moisture is the enemy of your rabbit’s hay because it can cause mold, which can be toxic for your bun. 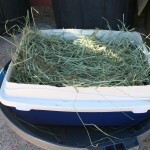 We use tight sealing plastic garbage cans that have never been used for trash to store our hay. There are some nice plastic bins available online for storing bales of hay, should you decide to go that route. Each of my rabbits eats about 8-10 pounds of hay a month. So with my three rabbits it would take a little over three months to use a whole bale of hay. A person with just one bunny will probably find that it is not practical to buy and store bales of hay, unless they have other critters that are eating it, too. We are lucky here in San Diego, because our local House Rabbit Society buys bales of hay and repackages it into boxes to sell to the public through several outlets around the county. It raises money for the organization to use to provide medical care for rabbits and the public get very fresh hay in manageable amounts to give to their bunnies. What a great win-win for us all! If you have a rescue organization in some other area of the USA, you might find this is a great way to raise funds and provide a great service to the rabbit lovers in your area. Most people whose rabbit will not eat pet store hay, will suddenly eat tons of it when given fresh stuff. If the pet food companies would find a way to deliver fresher tastier hay to public, they could forget about having to produce the gourmet treat varieties to get rabbits to eat it.